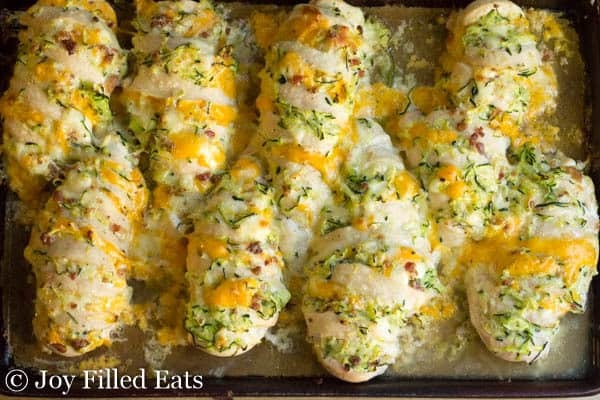 This Four Cheese Hasselback Chicken Recipe looks fancy but it’s actually a really easy way to make stuffed chicken. You can stuff it with anything but my version has four different kinds of cheese, shredded zucchini, and bacon. Bacon is always a welcome ingredient in my house. So, what do I do when my husband and I each buy a 6-pound pack of chicken on the same day? Make lots of chicken recipes. I’ve been seeing photos of Hasselback chicken on Pinterest for awhile now and I decided it was time to make my own version. Bacon crumbles were the first ingredient I grabbed out the fridge. Followed by cheese. And then I was stumped. I normally put a veggie in stuffed chicken and chicken casseroles. How could I stuff a veggie into those tiny cracks? And then I remembered my friend Marisa gave me one of her garden zucchini. Perfect. I shredded it, mixed it with the cheese and bacon and stuffed those chicken breasts. 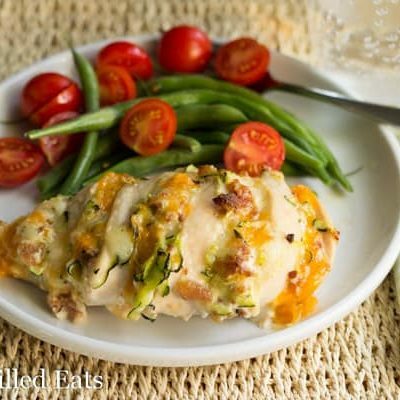 You can really use any types of cheese for this Hasselback chicken recipe. I used what I had. The muenster and provolone were sliced for sandwiches so I just stacked the slices and cut them into cubes. 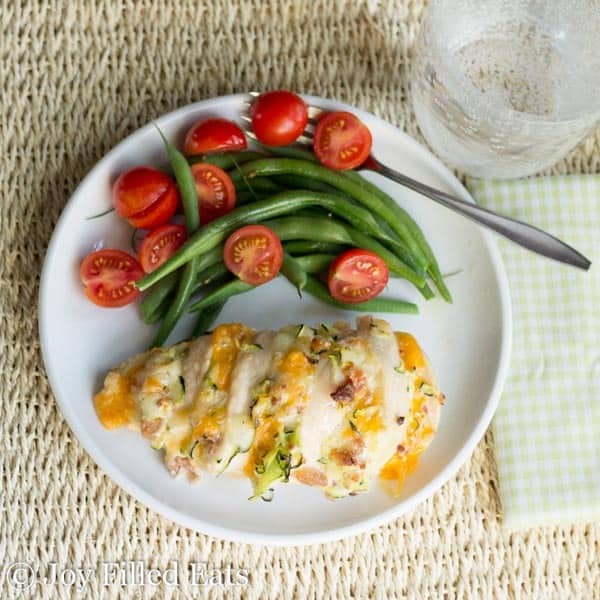 This Four Cheese Hasselback Chicken looks fancy but it's actually a really easy way to make stuffed chicken. You can stuff it with anything but my version has four different kinds of cheese, shredded zucchini, and bacon. Bacon is always a welcome ingredient in my house. Preheat oven to 400. Sprinkle a little salt on the shredded zucchini and set aside. 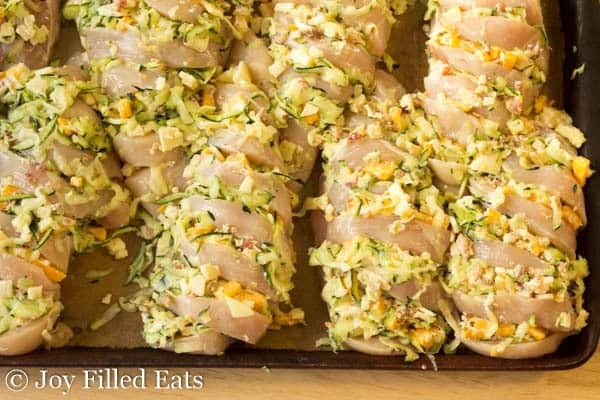 Cut slits in the chicken breasts every 3/4 inch. Be careful not to cut all the way through. Sprinkle them with a little salt and pepper. Squeeze as much liquid out of the zucchini as possible. Combine cheeses, zucchini, bacon, and garlic in a medium bowl. Mix well. Stuff the stuffing down into the slits of the chicken. Bake for 35-45 minutes until the chicken is at least 160 degrees. 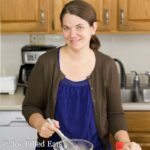 Is a serving size one chicken breast? May be a silly question, but could I just use regular shredded cheese? I don't have any chunk cheese on hand right now. Thanks. You didn't say when to use the bacon, do you mix it in with the cheese or sprinkle on top when finished? Mix it with the cheese. I made this for dinner last night. It was AMAZING! I didn't have provalone or muenster cheese so I used cream cheese cheddar and parmesan. I had some filling left over so I smeared it all over the top. It baked up nice and crisp. It's a good thing that I only made one for each of us or I might have eaten all the extras myself. Mmmm. Hasselback chicken... I just love it. Great idea adding the zucchini to it. Great! Pinned. 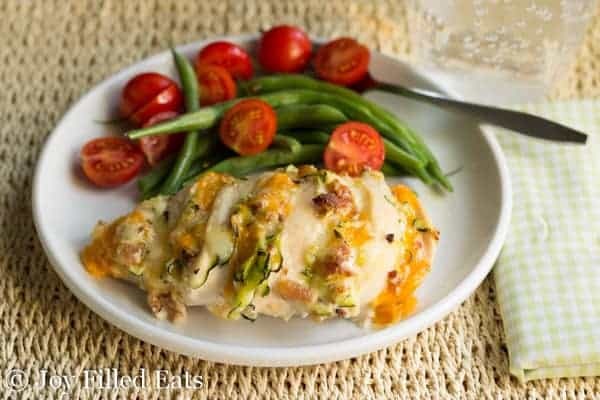 The more cheese the better is my motto, and this chicken is the perfect way to live that up. Love this SO much- and love that my family will adore it, too! Perfect weeknight dinner!